Before the voice tapes were released by the Washington Post that revealed obscene comments by Republican Presidential nominee Donald Trump, The Razor conducted a school-wide survey to determine campus opinion on the presidential election. Before the voice tapes were released by the Washington Post that revealed obscene comments by Republican Presidential nominee Donald Trump, The Razor conducted a school-wide survey to determine campus opinion on the presidential election. Although few students at Hopkins can vote in the general elections, they form a large part of student everyday conversations. “Election years are always exciting, although this one has a different atmosphere,” said Lilly Tipton ’18. Many people are concerned about the future of our country. Nation-wide election polls have shown that the election could go in any direction. Here’s a look at politics from the point of view of The Hill. Submitted replies came in from 401 students, representing 56% of the student population at Hopkins. The results put Hillary Clinton in the lead with 58.8%, while Donald Trump placed second at 25.6%. The survey also recorded the respondents’ respective grades. A breakdown by grade showed that tenth graders formed the greatest percentage of Hillary Clinton supporters, while eleventh graders had the greatest percentage of Donald Trump supporters. What role did the first debate play? In 23 cases, the debates altered only 6% of the respondents’ opinions about the candidates whom they supported. 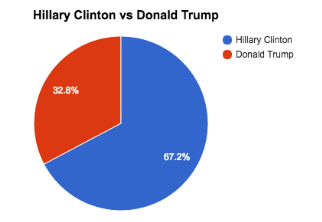 However, the data shows that Hillary Clinton gained 1% of respondents’ support while Donald Trump lost 1% of respondents’ support. 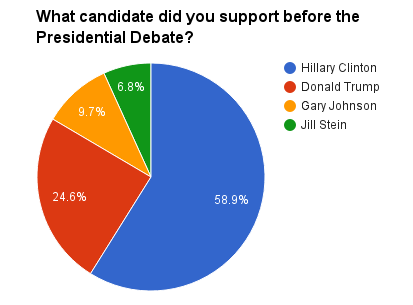 Interestingly, the debate also altered people’s opinions about third party candidates. Gary Johnson gained 1.3% of respondents’ support while Jill Stein lost 0.2% of respondents’ support. “The debate brought out the differences between the two candidates. It showed their differences in preparation, thoughtfulness, and clarity,” said Veronica Yarovinsky ’20. How satisfied are people with the candidates? Only 59% of respondents replied to the question: “Which candidate do you currently support?” In addition, many respondents commented that they do not like any of the candidates and are simply choosing the better of two evils. 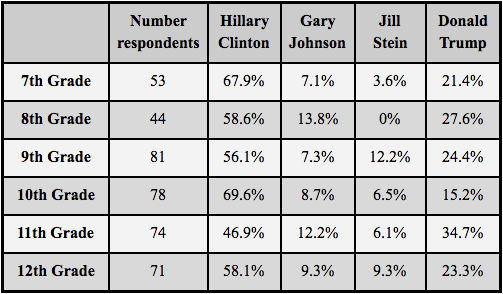 However, some respondents harbor strong opinions about their favorite presidential candidate. “Donald Trump is not fit to be president. He has no idea how to run a country, no idea what sacrifice is, no idea when to shut his mouth, and would not be here if he weren’t a stuck up, over-privileged, disgrace to society, born with a silver spoon in his mouth and given a Bugatti to drive the road of life that was paved for him long before he was born,” said Jason Alfandre ‘18. Several students replied that they wished Bernie were still a candidate. “I believe Bernie Sanders deserved to be president because he put forward ideas that were different and helpful. If he had won the primary, I believe that he would have had an even better chance at winning the election than Hillary Clinton,” said Beth Hartog ’19. Could Hillary Clinton be the first woman president? When asked to choose between just the Democratic and Republican candidates, Hillary Clinton maintained her lead with 67.2% of the answers. However, this statistic represents only 57.1% of ballots, as many students opted out of answering this question.